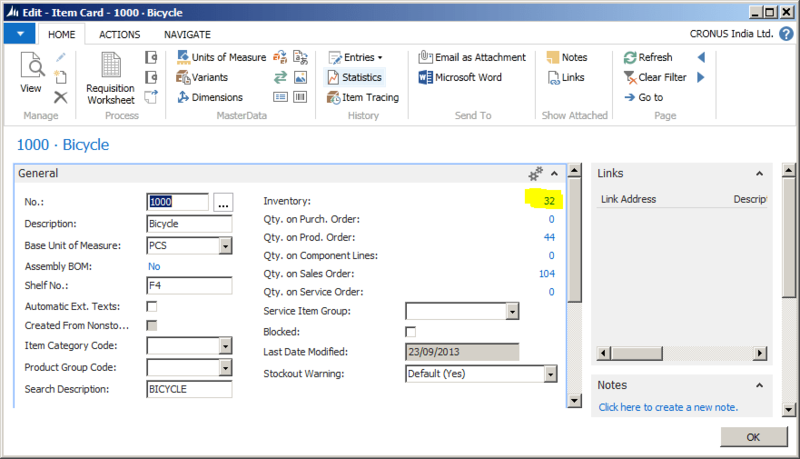 Right now the above link will open the Page 38 filtering the ‘item ledger entries’ with the Item No. ‘1000’. We need to change it further to make it filter data dynamically with the item no. from the report. We will make this change directly in report builder in our next step. 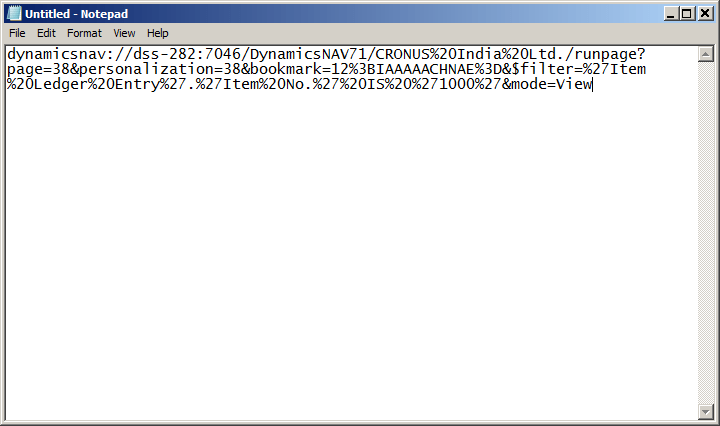 Open the report in NAV 2013 R2 development environment and go to View > Layout. 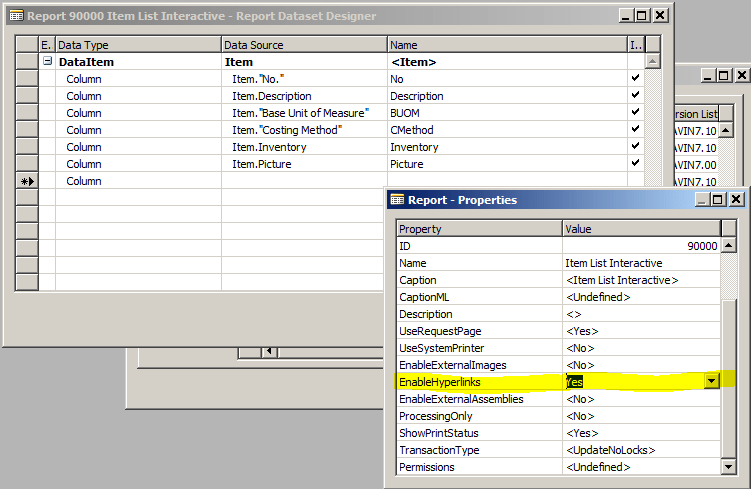 This will open the report layout in SQL Server Report Builder. Right click on the ‘Inventory’ textbox and go to ‘Text Box Properties’. 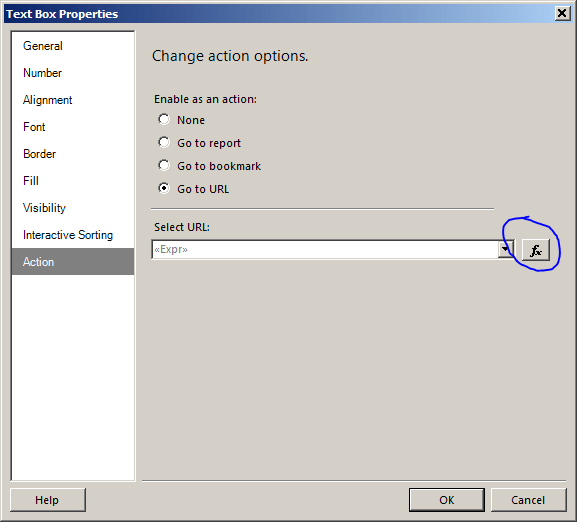 Go to ‘Action’ tab and select the radio button in ‘change action option’ to ‘Go to URL’. After this click on the ‘fx’ (as circled above) button next to ‘Select URL’ text box. Replaced the text ‘1000’ (the item no.) with the text ‘+Fields!No.Value+’. This makes the URL to pick up the Item No. from the value displayed in ‘No.’ field in report. Instead of manually typing it, you can actually select the ‘Fields (DataSet_Result) in Category box, Select ‘<All>’ in Item box and then double-click on ‘No.’ in the Values box. 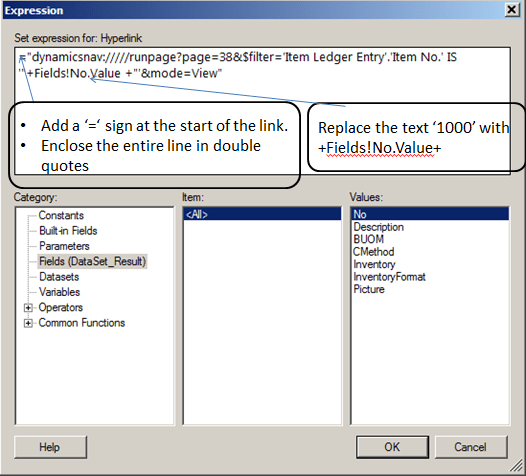 Change the property ‘EnableHyperlinks’ to ‘Yes’. And that’s it. 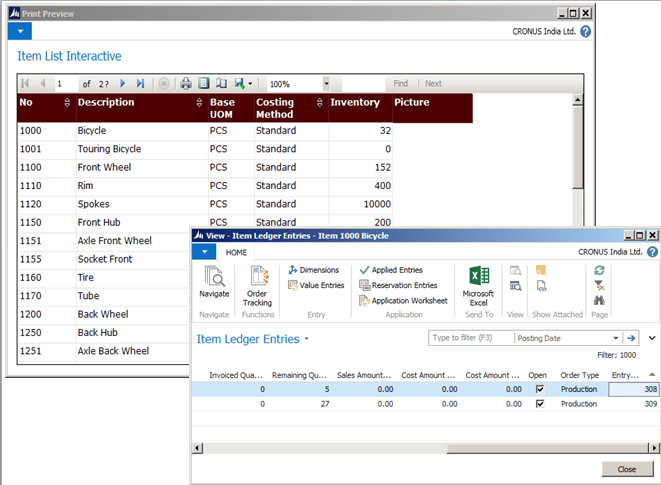 You are ready with your NAV 2013 R2 interactive report from where you can drill down to more detailed data. Let us test the same. Save the report and run it from the Object designer itself (that’s the good thing you can do in NAV 2013 R2 but not in NAV 2009 ). Once the request page opens, just click on the ‘Preview’ button. This will open the report viewer window. Hover your mouse on the ‘Inventory’ field values and you will see the cursor is getting changed to a ‘hand’ denoting that you can drill down from that value. 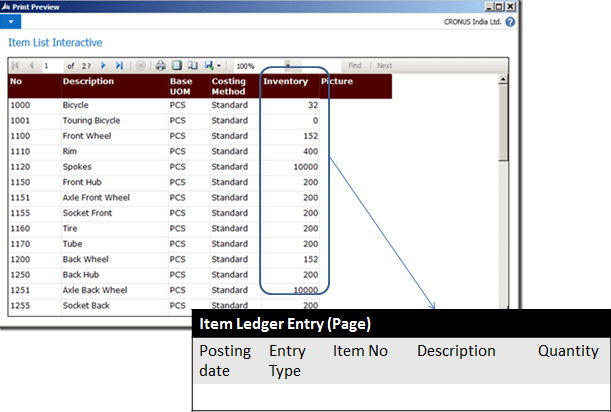 Click on the value and Item ledger entry page will open up with the entries corresponding to the item no in the report. 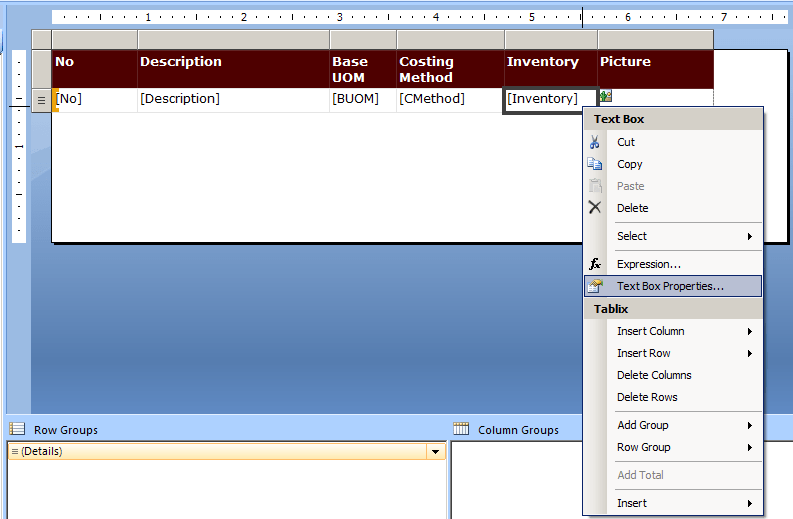 Try and see if all values are opening it’s corresponding item ledger entries only. Hope you are able to follow the steps mentioned here in creating your own interactive reports. You can leave your comment here in case you face any difficulty or you can write to me on the same at snehanshu.mandal@gmail.com. Catch you in my next post / session on NAV 2013 R2. Till then happy reading. The ActionInfo.Action.Hyperlink expression for the text box ‘Inventory’ contains a colon or a line terminator. Colons and line terminators are not valid in expressions. Remove the html encoding of amp; from your expression and try. Can we open an link as per the filters chosen by user at run time. 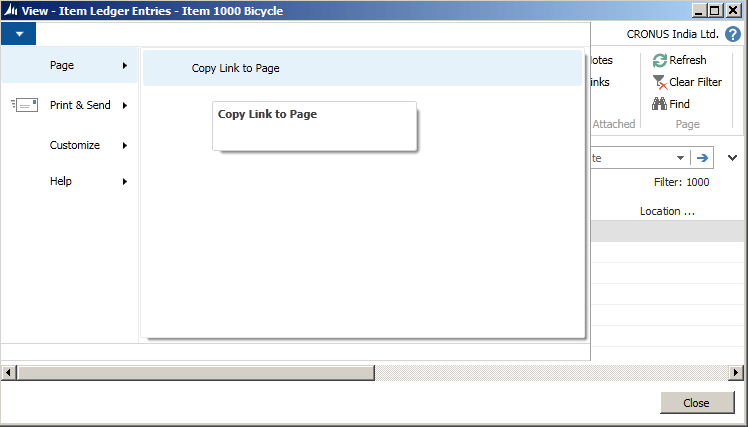 Ex-As u have given report for Item and after clicking on link it Opens ILE, ok. I want to give same thing, But user will choose its own filters from the request page(Any fields fm Item table) and Link will Open with that filters. Just replace the string Fields!No.Value with your field name and see that works. 2. The statement ‘Cust. Ledger Entry .Open’ should be ‘Cust. Ledger Entry’ .Open (missing single quote and extra single quote at the end. 3. you need to keep the value 1 in single quotes. Compare my string with your original string and you will find those gaps. Do let me know if it is resolved. if not I can investigate the same further. Sorry, the full string is below, ignore the previous one. Does anything stand out to why this wouldn’t open? Thanks for the great articles and blog!